한국 란도너스는 천안 600K에 도전하였고 모두 28명이 40시간의 제한시간 이내에 완주하였습니다. 라이더는 동이 트기 전에 시작했고 천안을 빠져 나와 충주로 향했습니다. 그곳에서 그들은 남쪽으로 향했고 대륙을 건너 풍요로운 한국의 농경지로 진입했습니다. 논과 작은 마을, 텅 빈 도로가 그들과 봉양까지 동행하였습니다. 라이더는 해질녘 봉양을 지났고 영동과 동상을 향해 서쪽 산등성이를 지났습니다. 그곳에서 라이더는 부여와 청양을 향해 남쪽으로 돌았습니다. 그리고 집으로 돌아오는 친숙한 길을 지나 해가 떨어진 후 천안에 도착했습니다. Korea Randonneurs accepted the challenge of the Cheonan 600K and a total of 28 riders finished this challenging course within the 40-hour time limit. Rides started before dawn and exited Cheonan to Chungju. From there they headed south, crossed the continental divide and entered the rich farmland of Korea. Rice fields, small villages and largely empty roads accompanied them to Bongyang. 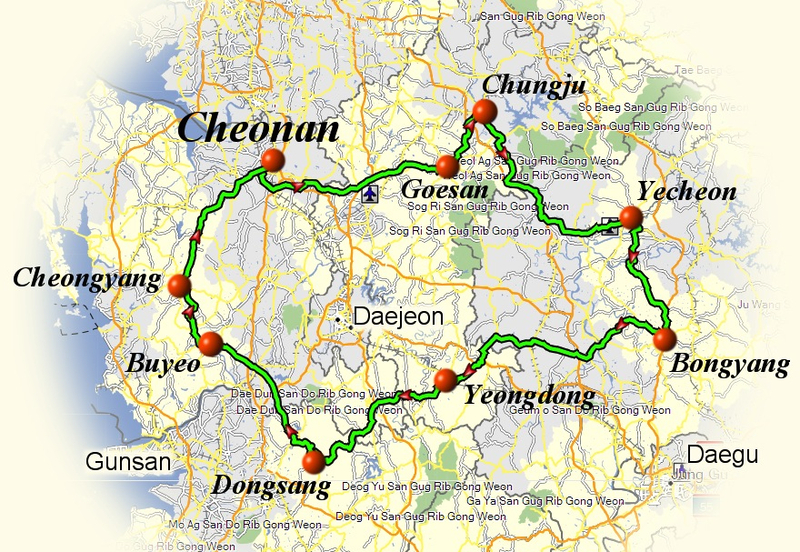 Riders left Bongyang by nightfall and turned west crossing mountain ridges to Yeongdong and Dongsang. From there riders turned north to Buyeo and Cheongyang before heading home on familiar roads and arriving Cheonan after the sun had set. Lee Soon Jin (이순진), the first female Randonneur (Randonneuse) to finish a 600k, also achieved Super Randonneur (SR) status. By finishing this 600K a total of 19 riders are now Korea Super Randonneurs (KSR): Choi Jae Hyung, Gwak Dong Won, Ham Jason, Hennighausen Lothar, Hong Kee Pyo, Jeong Jun Seung, Kim Man Geun, Kim Sung Hak, Kim Young Han, Kim Young Min, Kim Young Sam, Ko Seong Ik, Lee Sang Ok, Lee Soon Jin, Oh Hyun Taek, Park Kyoung Hwan, Seo Jae Ho, Seong Gi Heon, Yoon Byoung Hoon, .